KNOYDART FOREST TRUST (KFT) looks after woodland on the Knoydart peninsula on behalf of the Knoydart Foundation, the community landowner, and other landowners. We aim to manage the woodland to increase the benefits to the environment, local community and wider public. KFT is a company limited by guarantee with charitable status, run by a board of directors who are volunteers and elected by the resident community membership. There are around 70 members. We employ 3 local people and provide employment for several local subcontractors. We look after 919 hectares of woodland on community owned land. Our work is led by Woodland Management & Forest Plans that are developed in consultation with the community and other stakeholders. Trees and woodland are a vital part of our environment and support a wide range of plants and animals. Our long term vision is to link up the woodland habitat across the peninsula from Loch Nevis to Loch Hourn. 300 hectares of new woodland. The physical and mental health benefits of being out and about in the woods are well documented. 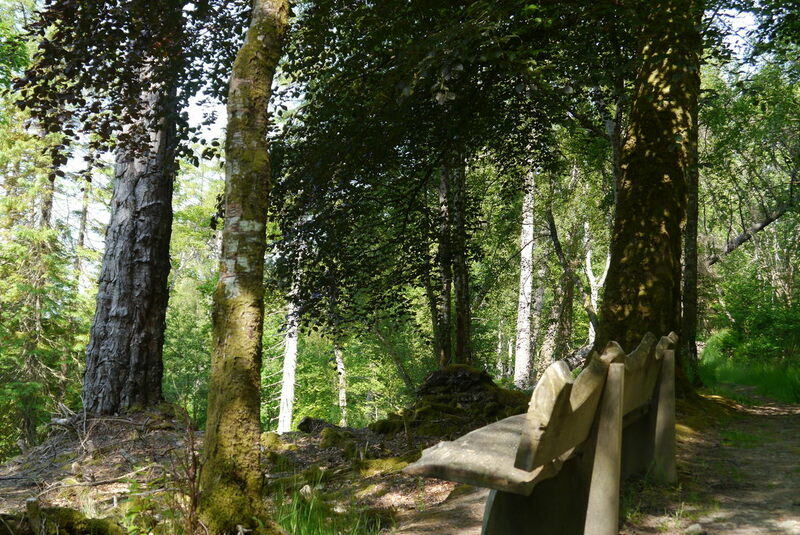 To help you explore and enjoy Knoydart's woods we have built and maintain paths & tracks, 2 mountain bike tracks, shelters, benches & sculptures in Inverie Woods. We work in partnership with the Knoydart Foundation Ranger Service who provide regular guided walks in the woods. By making the most of our woods we can employ local people and invest money back into the woodland and local economy. With Wood Knoydart, our trading subsidiary, we add value to our timber to produce and sell milled timber, firewood, wood products and timber buildings. This helps our tiny community and our woodlands to be more resilient. The Knoydart peninsula is on the North West Coast of Scotland. It is only accessible by boat or a walk over the mountains. 17,200 acres of the peninsula is community owned and managed by the Knoydart Foundation (www.knoydart-foundation.com/). There are many ways you can help us maintain the varied work that we do here on Knoydart. If you would like to Make A Donation, Gift Aid, Buy Our Products, Volunteer Programme or in some other way that we haven't thought of and YOU have ... please get in touch.